We all have hard days and easy days. Today was a doozy for me. Without retelling the long end of the story, I basically erased all my photos on my blog. I erased them somewhere else because of some advice given to me and now all of my photos are gone. Of course that gives me two choices; stop blogging (because these types of things have been happening to me since day one three years ago) OR stay up late every night for the next few weeks and slowly add back the photos to each of my 300 posts. 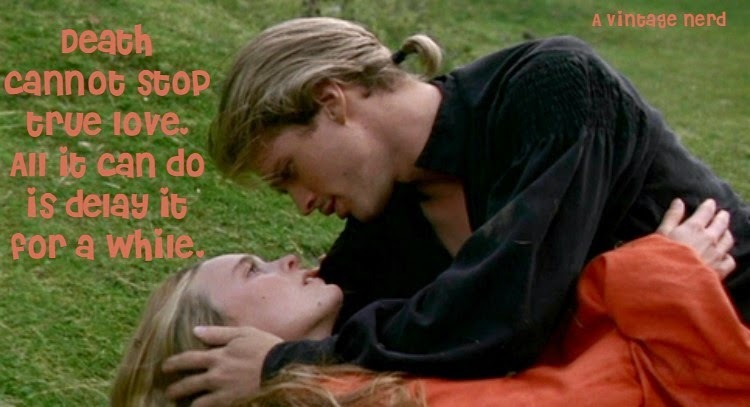 My friend Cori Lynn from Poodles and Pin Curls said it best when she quoted A Princess Bride and I thought it would make the perfect heading to my post. Thank you Cori Lynn! If I wrote a list of all the walls I hit while trying to blog and get my footing you would probably wonder why am I still getting back on the horse. Well, its simple. I love writing. I love being creative, And I love communicating with the world. Not to mention, I love vintage. How has blogging changed my life? Because of blogging I have forged friendships all over the world. I get out of my yoga pants and get dressed up and put on makeup because of blogging. I learned so many news things and tried a lot of things I never thought I would. So for a while you will see many posts without photos but fear not. Little by little I will add them all back and hopefully get my blog back on track. Thanks to my close friends and family for understanding why I would be devastated by this mishap and to you my readers, thank you for continuing to read! Great, be positive, that's the way to do it!!!!! Good luck, a lot of work ahead but if blogging helped you to find your way and makes you happy... GO!!!! Don't stop of course!!!! Never give up! We as followers and readers value your blog! Good luck! Sorry to hear about your mishap Daffny, I love that you are still so positive about everything. I'm sure you'll get the pictures back up in no time. Oh my golly, I can't even imagine the devastation!! And all the work of adding them again. How did this happen? I don't understand at all. I am a new blogger, please let me know what not to do so this doesn't happen to me. I don't know that I could recover. Good luck to you, I'm glad you aren't giving up. I am so happy that I have discovered your blog. Continue on! March forward:) We need you in the blogging world:) Fear not fine friend great things are in store for you! I am so sorry for you. I suppose the deletion you did "elsewhere" can't be reversed? Because that would seem to be the quickest solution. Do you have any backup of that place which you can restore? Even if it wasn't to ally up-to-date it would save you some work. I do love your blog, so please soldier on! Wow, that really blows! I'm sorry about that. I'd be so annoyed if that happened to me, I don't know what I'd do. Good luck getting everything back together, though. Oh Daffny honey, what an incredibly stressful thing to have happen. I'm truly sorry you have to deal with this and really have to say how much I admire your fortitude and desire to painstakingly take the time to replace all of your missing images. That is such a huge undertaking and one that I commend you on doing to no end.